Contegra's T423 4-20 mA transmitter provides convenient, easily adjustable signal spanning of the SLX 130-E Submersible Level Transducer’s process signal over as little as 20% of the sensor’s range. Additionally the T423 provides input simulation and three levels of transient protection on the process loop. Simulation allows the user calibrate the T423 on-the-bench. The T423 accepts a nominal 0-5 VDC input (or portion thereof) and provides convenient calibration to produce a 4-20 mA output proportional to that input. The T423 is loop powered, 12-28 VDC. It provides three levels of transient protection on the 4-20 mA loop: a gas tube arrestor for suppression of high voltages, transorbs, and varistors for fast clamping of lower voltage transients. 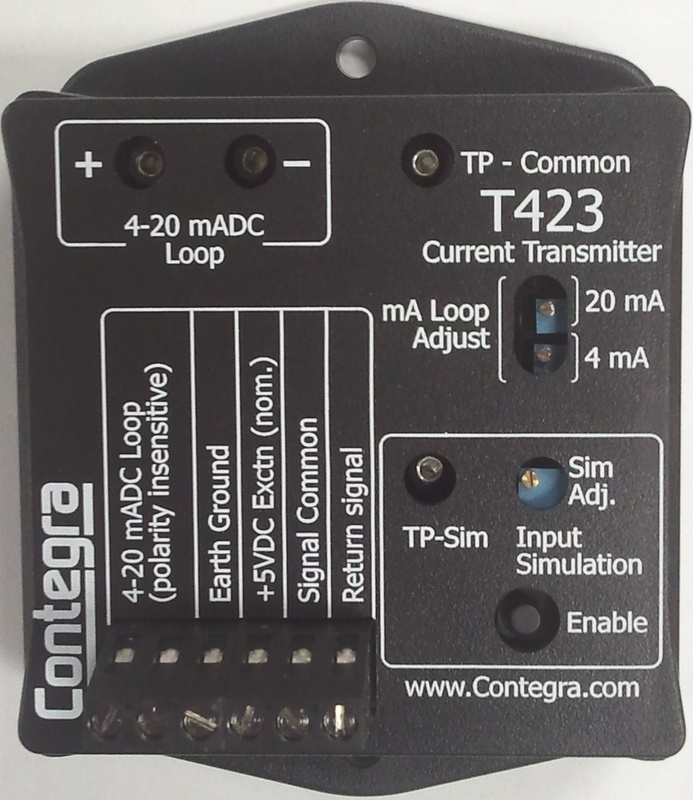 The T423 provides up to 3.8 mA at (nominally) 5 VDC to power the sensor.